A qualified retirement planner will have a skill set that goes beyond basic financial planning or providing investment advice. What Does a Retirement Planner Do? Like financial planners, retirement planners must understand your financial goals; knowing when you will need to use your money, and what you will be using it for. 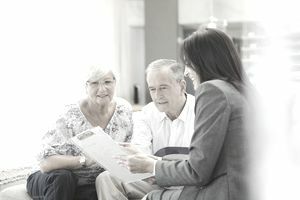 In addition, a retirement planner must have a clear understanding that the financial assets you are accumulating, as well as other resources you have such as pensions, Social Security, part-time work, home equity, etc., are all pieces of a puzzle that must be put together in a way that will result in reliable monthly paychecks once you are retired. This requires an in-depth knowledge of taxes, Social Security and retirement plan rules; knowledge often requires years of experience and training to accumulate. What Type of Advice Can a Retirement Planner Give Me? Good retirement planners will not make recommendations until they understand your expected time horizon, your level of experience with investments, your goals, your tolerance for investment risk, your need for guaranteed income, and a thorough understanding of all your current resources such as assets, liabilities, and current and future sources of income. Good retirement planners will want to know where all your investments are so that your portfolio as a whole will make sense and can be optimized to produce a steady stream of retirement income. How Much Do Retirement Planners Charge? Always ask a potential retirement planner for a clear explanation of how they will be compensated. What About Traditional Financial Planning or Investment Advice? Retirement planning is an area of expertise that falls under the broader category of financial planning but requires greater expertise. Investment advice is related to how your money is invested, but those who offer investment advice may not offer much planning. Many retirement planners will offer investment advice as well as a broader range of financial planning services, but it doesn't always work the other way around. How Do I Find a Good Retirement Planner? As you interview potential planners, seek someone who has expertise in tax planning, Social Security, and retirement withdrawal strategies. They need to be able to devise a timeline and plan that tells you how to take money out in a tax-efficient way, and they need to be able to objectively advise you on the use of guaranteed income products that can create security. One option is to check out RIIA, the Retirement Income Industry Association. This group offers a designation called an RMA, or Retirement Management Analyst. I went through the curriculum and acquired my RMA in 2010. If you want someone who specializes in retirement planning, I would highly advise you seek someone with an RMA designation; although currently there are only a few scattered throughout the country.